This was me over 10 years ago: dull, dehydrated skin with persistent acne, most of which were cystic, yet I was doing everything by the book. Including cleansing with a foaming cleanser twice per day. I mean, we have been told for decades we must, right? But what is really the truth? It wasn’t until I started questioning every part of my skincare routine and doing a thorough research that I actually managed to heal my skin. Easing down on cleansing, especially with harsh cleansers in the morning, helped my skin not only be healthier and clearer, but also look more youthful in my early 30s than it was in my 20s! First, let’s go over some of the often heard reasons to wash our faces in the morning, and my thoughts on each. Too much sebum contributes to acne, that much is true. However, too frequent washing and stripping your skin of its natural oils actually makes matters worse because it dehydrates your skin. If your skin is oily but dehydrated (it feels oily, yet tight), it will then try to produce even more oil to compensate. Yes, those harsh, over-stripping cleansers are making your oily skin worse! Your skin’s natural lipids lock the water inside your skin, keeping it hydrated. If your skin lacks water, more sebum will be produced to keep the remaining moisture in your skin. In the morning, excess sebum can be removed with a gentle toner like rose water on a cotton pad. This is a much gentler way of removing it than with a cleanser, especially a foaming one that contains sulfates (like Sodium Lauryl Sulfate – SLS). In addition, using a foaming cleanser means that you have to wash it off with tap water, which is also drying for the skin. Remember, some oil you do want to keep on your face because it keeps your skin naturally moisturized and healthy. You do not want to remove these dead skin cells in the morning, either with exfoliation or harsh cleansing, because they make up the skin barrier - the outermost layer of your skin. These dreaded dead skin cells are there to protect the living skin cells underneath. They are, in fact, the only cell types ready to face the harsh environment - and they are dead! Without a robust skin barrier, your skin is much more exposed to the harsh environment, pollution, toxins, pathogens, oxidative damage (which leads to skin aging and acne) and infection from bad bacteria and fungi. We are past that silly notion that dirt somehow causes acne, aren’t we? Plus, there is no dirt on your face from sleeping whatsoever, unless you are using commercial laundry softeners. They leave a waxy residue on your pillowcases, which can clog your skin while you sleep, and washing your skin in the morning might be too late to fix that. Switch to a natural softener instead or skip it altogether for your sheets and pillowcases. Instead of a commercial softener, I love using white wine vinegar with a few essential oil drops of choice. Trust me, it works great and smells fantastic. Not to mention it’s also more environmentally and skin friendly. As your skin produces sebum, it flows from your pores, pulling dead skin cells and oily substances with it (including those found in your skincare products). All of that gets off your skin and onto the pillowcase, your hands, etc. True, there might be some product residue in the morning, depending on the products you are using. Usually, silicones are pretty difficult to get off your skin (even with cleansers), which is why I avoid them in my skincare products in general. Those are ingredients like dimethicone, cyclomethicone and others ending with -cone or -siloxane. For most products you applied the night before, a simple swipe of a toner on a cotton pad will remove what needs to be removed. Again, rose water or another gentle toner to the rescue! It will be enough to not only wake you up, but also to wake up that beautiful natural glow of your skin. Your skin will feel fresh and cleansed while keeping its optimal pH and a strong skin barrier, ready to face the challenges of the day. When you cleanse your skin, you also enhance the penetration of ingredients applied afterwards. This is due to the surfactants, substances in cleansers that do the cleansing job, but also disrupt the integrity of the skin barrier, making it leaky. Therefore, ingredients in the products you are using will probably penetrate somewhat better after you cleanse with a foaming cleanser. However, this is heavily dependent on how big they are (their molecular mass, measured in daltons – Da). Usually, anything bigger than 500Da has a hard time passing through. More importantly, when you enhance the penetration, remember that you also make your skin more penetrable to other harmful substances and bad bacteria. Unfortunately, we don’t get to decide that the good ingredients penetrate, and the bad ones stay away. 1. Your skin needs an adequate amount of its natural lipids (oily substances) to be moisturized, which many cleansers remove. Removing ceramides, cholesterol and Natural Moisturizing Factors (NMFs) weakens your skin barrier and dehydrates your skin. These precious substances also make your skin stay youthful! So why waste money on the skincare products with those ingredients when you can simply let you skin keep its own natural ones? 2. You don’t need to remove dead skin cells in the morning, which cleansers can do. These dead skin cells protect the living cells underneath, which are not yet ready to face the harsh environment on the surface of your skin. 3. Cleansing may also disrupt the integrity of the skin barrier. This leads to more water loss from your skin, causing dehydration. 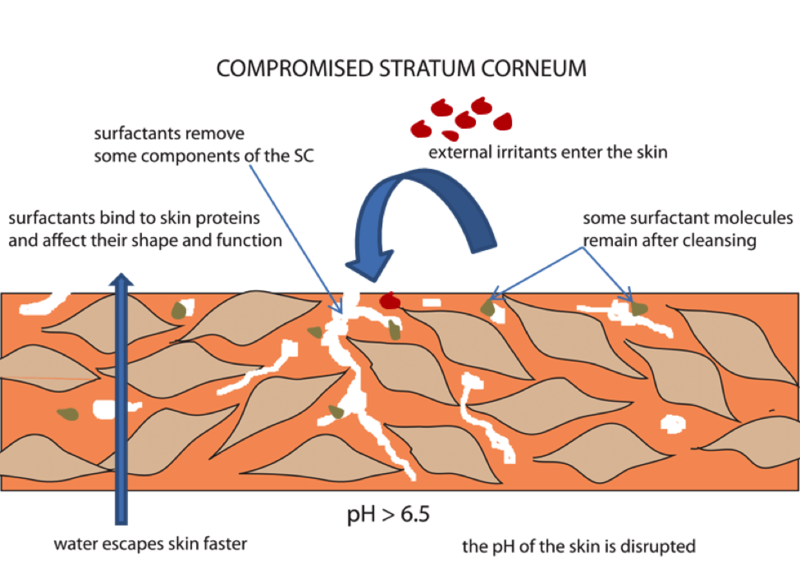 Not to mention that cleansers also disrupt the skin’s optimal pH level (acid mantle), which can slow down your natural exfoliation process (desquamation) and synthesis of lipids, such as ceramides. 5. Cleansers can also enhance the penetration of various substances into your skin, including harmful substances and pathogens.